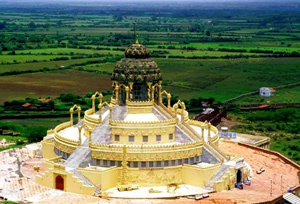 Samosaran Mandir is built at the foot hills of the Shantrunjaya Hills in the city of temples, Palitana, Gujarat. Samovasaran Mandir is a modern temple situated at the base of the main temple complex. Samosaran Mandir consists of a large figure of Mahavira in the sitting position with feet in crossed position. The idol is decorated with gems, jewels, gold and silver. The main temple of Samosaran has an iconic image of Adinath made up of a fine piece of marble and the eyes of the idol are made up of crystals. In front of the temple there is a quadrangle that has been designed elaborately. Another famous shrine is situated just opposite to the Adishwara temple. The idols of Nakoda Bheruji, Manibhadra veer and Ghantakarna Veer Dada can also be found in the holy shrine of Samovasaran. The temple is composed of marble and consists of halls made up of columns and towers. There are number of openings in the temples that are surrounded by high mounted walls. The floors are also made up of marble and contain tessellated pattern. The interior of the temple is designed and carved intricately; the ceilings of the temple has pattern similar to geometrical laces that have been clustered together to form a canopy. A number of festivals are celebrated in the temple and the most important being Mahavira Jayanthi celebrated to mark the birthday of Mahavira. In this festival, the people of Jain community observe fast and alms are given to the poor people. Special festival is held on the full moon day according to the Jain calendar. The temple complex in and around the hill is open for the devotees. The temple remains closed for four months during the monsoon season.